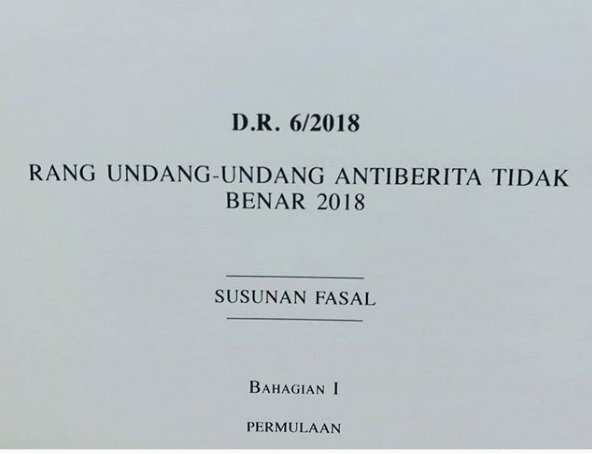 Anti Fake News Bill 2018 tabled. KUALA LUMPUR: The Anti-Fake News Bill 2018 aimed at curbing the dissemination of inaccurate news and putting in place deterrent measures was tabled for first reading in the Dewan Rakyat today. The bill was tabled by Minister in the Prime Minister’s Department Datuk Seri Azalina Othman Said. Dewan Rakyat deputy speaker Datuk Seri Ronald Kiandee was in the chair. According to the Bill, the proposed Act aims to protect the public from the rapid spread of fake news while ensuring respect for the right of freedom of speech and expression under the Federal Constitution. It interprets the inaccurate news as any kind of news, information, data and reports published which, in part or whole and in whatever form including write-ups and visual or audio recordings, are false. Azalina said that with the development of technology over time, the dissemination of fake news had become a global concern and increasingly serious, so much so that it encompassed the public. “It is hoped that through the proposed Act, the public will become more responsible and cautious in sharing news and information,” she said. The Bill proposes that the Act can be enforced on anyone, whether a citizen or foreigner, who commits the offence of spreading incorrect news on Malaysia or Malaysian citizens, outside Malaysia, and it could be interpreted as having been committed in Malaysia. According to the Bill, individuals convicted under the Act can be fined up to RM500,000 or sentenced to a jail term of up to 10 years or both. For subsequent offences, the offender can be fined up to RM3,000 per day for the duration of the offence after conviction. In addition to these penalties, the court can also order an offender to make an open apology to the affected party or parties in a court of law or in the media. The Bill also provides for legal action against individuals who provide financial aid to those who produce and disseminate fake news. If convicted, the funder can also be fined up to RM500,000 or sentenced to a jail term of up to 10 years or both. The Bill also allows the court to order the offending party or parties to destroy the publications containing the fake news, and those who decline to do so can be fined up to RM100,000 as well as fined RM3,000 for every day of the duration of the offence following the conviction. The Bill will not involve additional expenditure by the government.